12m retractable with 6m centre mount container. Every year between 400 000 and 500 000 ISO containers are transported on South African roads with the majority of them in breach of Regulation Number 224 (b) pertaining to the overall height of the vehicle and load. This is about to change writes Andrew Parker. With the maximum permissible height for container transport restricted to 4,3m, over 50% of container trucks on South African roads measure up to 4,6 m from the ground to the top of the container. This is about to change if the Department of Transport (DoT) has its way. 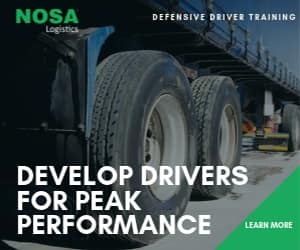 In spite of protracted lobbying by various parties including The Harbour Carriers Association (HCA) and the Road Freight Association (RFA), the DoT says it is not going to amend the Road Traffic Act to allow container trucks to exceed 4,3 m and that the practice of issuing TRH 11 abnormal load permits to allow operators to transport containers will be discontinued. 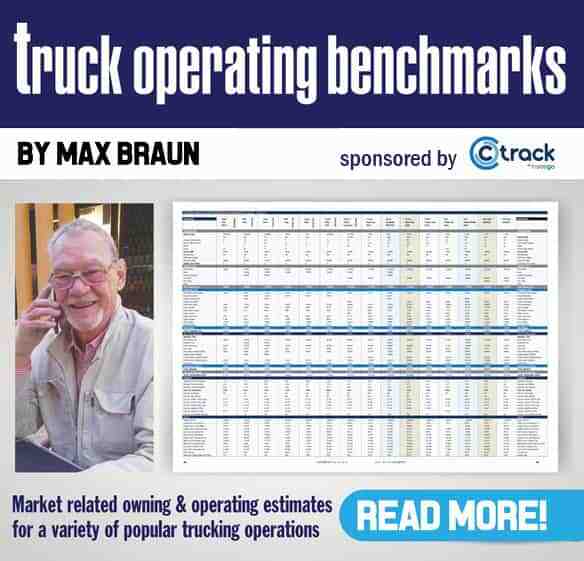 Operators in the container haulage market using flatdeck trailers to ship their consignments are now faced with the unenviable prospect of making major changes to their vehicles to make them comply with the regulations. This is going to take some time and cost a lot of money. At this point, the DOT has not set a date by which container trucks must comply so operators have some time in hand. The RFA and HCA say they are going to go back to the DoT for further mediation. The problem goes back over a decade with the introduction of high cube containers. These are similar in structure to standard containers, but taller. Standard containers have a maximum height of 2 591 mm (8′ 6″). High-cube containers are 2 896 mm (9′ 6″) high. 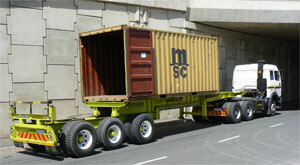 High-cube containers are for the most part, 12m (40′) long but are sometimes made as 13,7m (45′) containers. The problem is not the container height but the fact that they are largely transported on flat-deck trailers which have an average deck height of 1 550mm. This means container trucks are reaching a height of between 4,5 m to 4,6 m. This, incidentally, is the same height as a standard double-decker bus or a car carrier , but that is by the way. The main thrust of the DoT’s reasoning to restrict container trucks to 4,3m is that they are concerned that firstly, container trucks are too high to negotiate bridges on secondary routes and secondly, they are unstable. There has been further argument from certain sectors of the transport and logistics industry that the deck height of the flat-deck trailer combined with the floor height of the container are incompatible with established docking bays resulting in increased loading and unloading times. When this argument resurfaced last year, FleetWatch spoke to a number of transport operators on the issue of transporting high-cube containers by road. These included Freight Haul, Freightliner Transport, Westmead Logistics, Landway Carriers and Big Box Transport. Not one transporter said they have experienced any vehicle stability problems or had an accident due to over-height containers. The say high cube containers fall within the guidelines as given for abnormal transport – TRH 11 Section 4.10, Stability of Loaded vehicles. The general manager of one haulage company says when axle mass limits were raised from 8,2 tons to 9 tons, an amendment should have been made to make allowance for the increased height of the truck and trailer vehicle combination. Transporters also say they have not experienced any loading or unloading problems due to incompatible dock heights but say, as a rule, professional hauliers check what loading and unloading facilities are in place prior to sending a vehicle to a client. Dock and trailer height problems do occur from time to time but these are considered exceptions to the rule. In short, it seems there are no major problems out in the field due incompatible trailer and dock he ights. Transporters are advised to check on loading and unloading facilities prior to sending a vehicle to the site. A major national supplier of dock levelling equipment say their customer base has not reported any problems relating to the height of the dock and the trailer/container or with difficulties in loading and unloading. Explaining the history of how this situation has developed over the years, Kevin Martin, CEO of Freightliner Transport and vice chairman of the Harbour Carrier Division of the South African Association of Freight Forwarders, explains that high-cube containers came with an increased rating of 30 tons, up from 25 tons. In tandem with this, the non trailer container market also went through changes with high axle ratings (8,2 tons to 9,0 tons). Tyre size moved from 900/20 to the 11-00/20 and the 12 R/415/385 super single. Axle tracks increased to 1,93m , 3,03m which, including the tyres, provides a wheel track of 2,45 m. In short, these developments led to the advent of the super link to accommodate both 6m and 12m containers on one vehicle. Martin says high-cube containers represent 50 % of all container movement in South Africa. “Around 500 000 containers were transported by road during 2007 mostly on 1 550 mm high trailers with no increase in reported accidents directly attributed to the height. FleetWatch approached three trailer manufacturers, Kearney’s, Afrit and Trailord for comment. They concur that, depending on the design, it is possible to lower some of the flat deck trailers but this is an expensive exercise. Using alternative wheel rims and low profile tyres will also assist in reducing the overall height. The bottom line from these manufacturers and what they say is that the most sensible solution is to use skeletal trailers to transport containers , finish and klaar. Well not quite. According to Charles Lovell, Kearney’s business manager, in addition to the trailer, the fifth wheel on the truck tractor has to be lowered as well. Lovell says Kearney’s is one the few trailer manufacturers in South Africa producing a large number of skeletal trailers with deck heights of 1 400 mm. “These go to reputable hauliers who are operating within the confines of the law,’ he says. Lovell says the DoT is quite correct in maintaining the current legislation and says most of the fuss is being made by professional hauliers who should have know better, in spite of the fact they are using flat decks in order to get better utilisation out of their trailers. Trailord MD Rui da Silva says operators “must adapt or die,’ adding that South Africa is not the only country using these containers and local operators should be pro-active and work with the authorities to find the most effective and economic solution for everybody concerned. Afrit’s marketing manager Leon van der Wetering says the DoT must allow for a reasonably long lead time in order for operators to be able to comply. “There is no quick fix solution to this,’ he says.